Ambur Chicken Biryani is an authentic and traditional recipe from Tamil Nadu which is a dum style ambur chicken biryani from ambur region. This ambur dum biryani is totally different from traditional indian biryani recipes or hyderabadi biryani. This is almost similar to tahari recipe from hyderabad with slight variations. 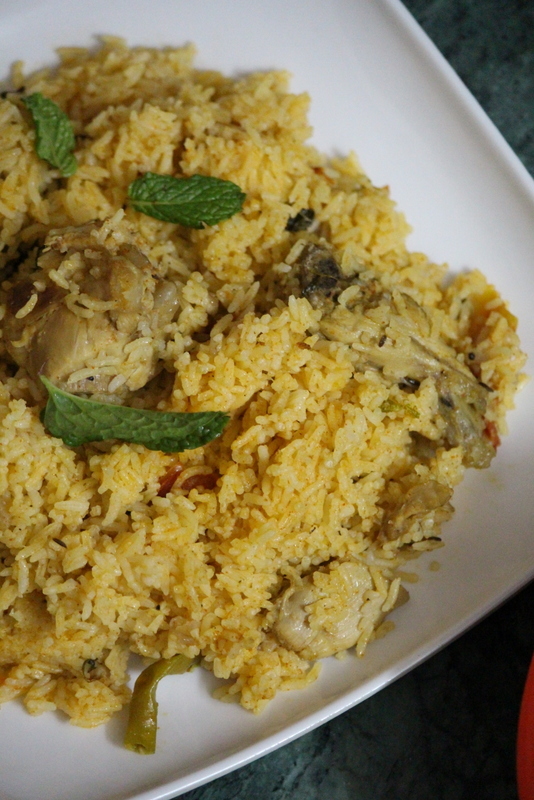 I have already posted ambur mutton star biryani which I really loved making it and now I wanted to make this delicious ambur chicken biryani recipe and post it for my blog readers…. 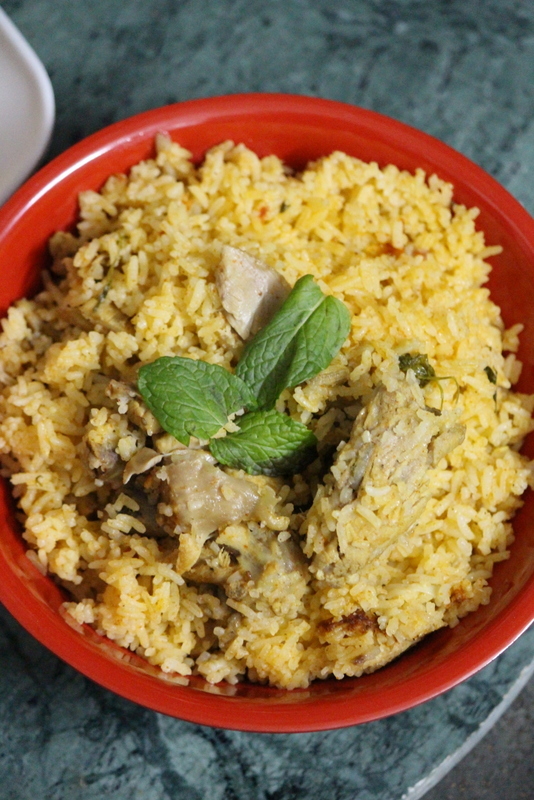 This ambur chicken biryani can also be made using a pressure cooker rather than placing on dum….however, here I have used traditional method of cooking and used a cooking pot to make the biryani… It is almost like the tahari recipe where I have used mutton to make it. Note: In Tamil Nadu biryani is usually made with seeraga samba rice but, in other regions it can be replaced by basmati rice or ordinary rice which is handy at your place. 1 tbsp lemon extracted juice. Add cinnamon sticks, cardamoms, cloves and saute it. Add sliced onions, saute, add green chillies, stir well. Cook until onions are slightly soft. Add chicken pieces into it and roast well. Add salt, turmeric powder and roast until chicken leaves oil. Add chopped tomatoes, mix and cook until they get soft. Add dried red chilly paste, mix and cook for few minutes. Add beaten yogurt, mix and cook for few minutes. Add garam masala powder, black pepper powder, chopped coriander leaves and mix well. Add little water and cook until the chicken gets tender. Meanwhile when the chicken is cooking start preparing the steps of rice. For that, take a cooking vessel, add water generously, add salt, cinnamon stick, caraway seeds, cloves. Add little oil into the water and boil the water. Add the washed rice into it. Cook until it is 60-70% done. Add the strained rice onto the chicken curry that is cooked. Mix the chicken well with the rice. 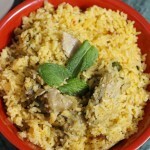 Add chopped mint leaves all over the rice and chicken. Add a cup of water all over the rice. Add ghee and lemon juice all over. Add little oil all over the rice. Cover the lid tightly with any weight or seal it with chapathi dough. Dum the biryani for ten minutes on high flame. Reduce the flame to sim and dum the biryani for another 15 minutes. Serve the biryani with raita or any curry!!! 1.Red chilli powder too can be added in place of dried red chilli paste. 2.If basmati rice is used to make this biryani then soak it for about 30 minutes before adding it to the boiling water or add directly if plain ordinary rice is used. what is the quantity for 2 persons and how to do it in pressure cooker?